Hannah Poe peers into a large microscope in the Hector F. DeLuca Biochemical Sciences Building, seeing not just florescent molecules of RNA, but also a future career in biochemistry research. Poe is about to start her last year in the Department of Biochemistry’s undergraduate program, but it will only be her second year on the University of Wisconsin­–Madison campus, as she is a transfer student from a university in Colorado. In addition to her classwork, she became involved in undergraduate research in the department and is currently an undergraduate summer research scholar in Aaron Hoskins’ Lab. The Biochemistry Undergraduate Summer Research Scholarships help undergraduates gain focused, full-time research experience early in their academic careers. The funding is made available to students from generous donations made to the Department of Biochemistry. The funds allow students to avoid taking time out of the lab to make money to cover summer expenses. In return, students work in the lab for 30 to 40 hours per week for eight weeks during the summer and write a research report on their findings. 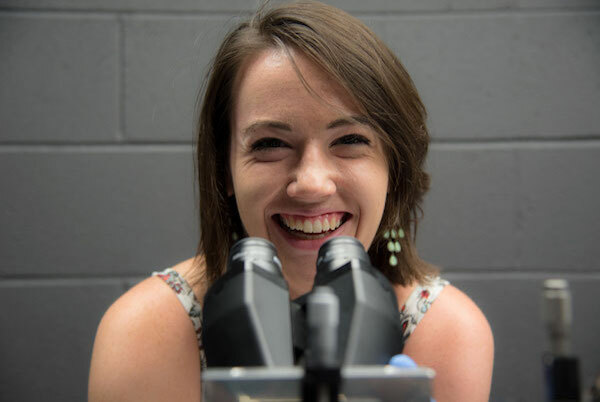 Poe actually started working in a lab as soon as she got to campus, eventually working her way to the Hoskins Lab last January and then securing a summer research scholarship. In the lab, she places small molecules that emit light, called fluorophores, on a synthetic strand of RNA, nicknamed Mango. These experiments allow her to characterize how Mango functions as a molecular beacon for lighting up RNAs in cells. The Hoskins Lab is deeply involved with researching the spliceosome, a cellular machine essential for processing precursors to messenger RNA (mRNA) after genes are copied from DNA. The spliceosome is essential in humans for producing the correct mRNA from genes. These mRNAs ultimately pass along the genetic code in the cell to form proteins needed for function. Mango will someday be used by the Hoskins Lab to discover how different components of the spliceosome work together by allowing researchers to follow RNA movements and interactions in live cells with a microscope. “[The spliceosome is] really critical in genetics and general cell activity, so the lab is trying to solve the structure and investigate the interactions between different components of this huge multifaceted mechanism,” Poe explains. In the lab, undergraduates are mentored by the lab’s principal investigator in addition to a postdoctoral scientist or a graduate student. Poe works with Hoskins and postdoctoral scientist, Clarisse van der Feltz. In addition, Hannah shares her results with a Hoskins Lab collaborator on Mango, Peter Unrau of Simon Fraser University in Canada. Hoskins echoed van der Feltz by adding he is fortunate Poe decided to join his lab. He also says it is extremely important for undergraduates to get involved in research. The department awards around 15 Undergraduate Summer Research Scholarships each year. The application opens around the beginning of December via Scholarships@UW and the deadline is approximately the beginning of February. Kendra Gurnee, the student services coordinator who advises Biochemistry undergraduates, adds that the Undergraduate Summer Research Scholarships are not the only way students can get involved in research. Undergraduate Research Scholars is a campus-wide program that connects first and second year students with faculty in many disciplines. The department also offers the Biochemistry Scholars Program, where first-year majors apply and are accepted to be placed into a lab their sophomore year. Joe Kraft, a senior in Thomas Record’s lab and another recipient of an Undergraduate Summer Research Scholarship, says the mentor-mentee relationship it provides is extremely beneficial. The basic research happening in the Record Lab has allowed him to gain experience in lab fundamentals essential for a career in research. Kraft and Poe are among hundreds of undergraduate researchers on the UW–Madison campus who have benefited from their time in the lab. To contribute to this summer research experience you can donate to the Department of Biochemistry. Kraft plans to ultimately pursue a Ph.D. in science, with a particular interest in ideas like engineering immune cells to fight cancer. Poe’s summer of research has shown her she enjoys research and may return to graduate school after working in industry for a few years after graduation.